No, I haven't dropped of the face of the earth, although my blogging efforts of late might have made you all think so. But I reward you with a pic of my Rainbow Bee-eater. She's currently roosting at the Quilts Across Queensland display, at the Ekka in Brisbane. So if you're a Brisbanite or near enough, you can get to see it for real. And what do you know, she took out 1st place small quilt professional section! There's another ribbon for the brag wall! 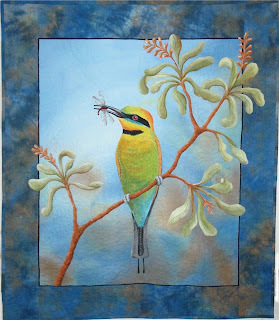 I enjoyed the challenge of using different techniques to execute this little bird, although it was extremely tricky sewing the borders on before appliqueing and then getting the whole thing to stay square. Not sure I'll try that trick again, I don't really like to repeat headaches in a hurry. Its 110cm x 127cm. And if you are wondering what I'm secretly sewing away on right now, the only hints I'm giving out is this time the birdie is a male! WOW! That is beautiful. congratulations. Flaunt whenever you like, I think, Bernadine! Your quilts are magnificent - they must take you forever to create..... thank you for sharing them. This is exquisite. Thanks for posting a photo for those of us who can't get to the Ekka. We get these little guys in our garden and they always bring a smile. Beautiful. Letting the applique meander over onto the border is a lovely design feature but I know what you mean about the stress it may induce where the squareness of the final product is imperative. Looks like you did a great job of that. beautiful! They're glorious, those birds, aren't they.